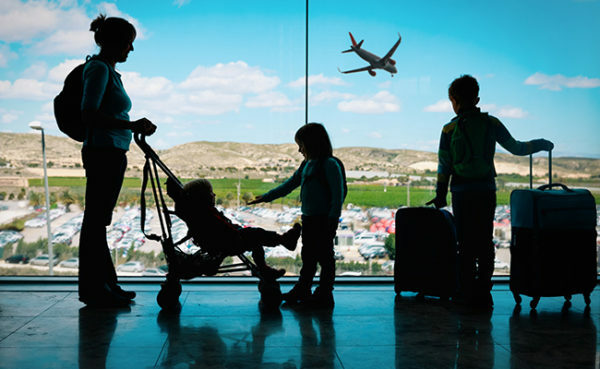 When you’re not a cookie-cutter two-adult, two-children family, it can be disheartening to see incredible flight and accommodation deals that you simply can’t access. The trick is to not fight the system, and by this, I mean just because a family of four can easily stay in a swanky hotel for two weeks, it doesn’t mean larger families have to do the same. Don’t get me wrong, we have spent 10 luxurious days in adjoining rooms at the Novotel Cairns Oasis Resort to explore Far North Queensland, Kuranda and the Great Barrier Reef, and it was epic. But it also cost thousands (don’t tell my husband). When you’re a big family without a big budget, you holiday a little differently. Our family of five takes between four and six trips a year, but the difference is they’re usually just for two to four nights, with a 10-day beach camping adventure around Christmas. And what’s our secret? We meticulously comb websites for deals, don’t travel far from home and have come to realise that you don’t have to jet-set across the globe in order to make memories with your family. We had a fabulous holiday just an hour from home at Echo Valley Farm Stay in Springbrook National Park, which is found in the lush Gold Coast hinterland. The working farm has a quaint cottage big enough for six people, and the kids frolicked with goats and horses and collected fresh eggs every morning. To them, we could have been anywhere in the world. If you dream of lounging by a pool while the kids swim from dawn to dusk, scattered across picturesque Australian locations are holiday parks and camping grounds with pools, water slides and spa pools. Australia’s fantastic holiday parks have been made with large families in mind. It’ll cost you around $1000 to $1500 for five days instead of a potential $10 000 for flights and two rooms in a resort overseas. If you have a camper trailer or tent, it’s even cheaper. The RAC Cervantes Holiday Park in Western Australia is two hours north of Perth and located beachfront in Ronsard Bay. With large cabins, a heated pool and playgrounds, it’s also close to the world-famous Pinnacles limestone formations at the Nambung National Park. Across the country is the BIG4 Melbourne Holiday Park, just nine kilometres from the CBD with villas that sleep eight. Holidays parks fit the bill because they’re affordable, sleep large numbers and take the hassle and cost out of amusing ‘I’m bored’ kids. For the price of one night in a plush hotel we spent two at the Gold Coast’s Turtle Beach Resort in a two-bedroom apartment. Despite the rain, we watched the kids in the water park from a licensed cafe, played mini-golf and had a ball. My tween wasn’t delighted about sleeping in her brothers’ room on a roll-away bed, so we moved her to the lounge. Problem solved! You can save thousands in eating-out bills if you cook while on holiday. Then you can use this money to fund an extra trip each year instead. As a big family, you can’t go past serviced apartments or privately owned houses and units close to the action. I’ve lost count, but we’ve probably stayed in about 15 in the past three years for an average of $250 to $300 a night – for three bedrooms. On the Sunshine Coast, I scored an off-season deal at Sebel Twin Waters Resort in a luxe three-bedroom apartment. It included access to the nearby Novotel Twin Waters Resort, so the kids could sail, kayak and swim all day. The trick is to always be on the look-out for a great deal and know it when you see it, even if it’s for next year. Mantra on the Esplanade in Darwin’s CBD has three-bedroom apartments within a stone’s throw of the water, and full cooking and laundry facilities to keep costs down. Also, it pays not to judge an old apartment by its dated decor. We’ve stayed in many that have been cheap and cheerful, with lots of space and awesome ocean views in place of shiny interiors. Always ask for a 10 percent discount when booking over the phone, or sign up to the provider’s newsletter online and you’ll usually get a discount code. While an acquired taste, cruises ARE an option for big families, with most operators offering a variety of room options. Norwegian Cruise Line ships depart from Sydney and have a large selection of family rooms. Carnival Cruise Line leaves from Sydney and Melbourne, with family ocean-view staterooms with two twin beds, two upper bunks and a sofa bed. All of Royal Caribbean’s family staterooms sleep six. Cruise deals do pop up, and if you can go on short notice you’ll often score a bargain. Usually, kids must be three or older to join children’s programs, so keep this in mind. Once you overcome preconceived ideas about what a family holiday should look like, you’ll discover big-family adventures around every corner. This post was originally published in Holidays With Kids magazine and is republished here with permission.